Two single beds that can convert into a European king-size bed, a private bathroom with tub and shower, hair dryer, floor-to-ceiling windows that open to a balcony, sofa bed, sitting area, walk-in closet, satellite television with radio, mini-bar, safe, coffee table, internet connection from your own laptop (on payment), and desk. Two single beds that can convert into a European king-size bed, a private bathroom with tub and shower, hair dryer, floor-to-ceiling windows that open to a balcony, sofa bed, sitting area, walk-in closet, satellite television with radio, mini-bar, safe, coffee table, internet connection from your own laptop (on payment), and desk. The new Wellness Experience - powered by Technogym, gives you the privileged access to state-of-the-art fitness equipment, a comprehensive one-on-one health assessment, a personalized fitness program and a selection of healthy food and drink options to choose from. Two single beds that can convert into a European king-size bed, some staterooms have an upper bunk or two upper bunks to accommodate a third guest and/or fourth guest; a private bathroom with shower, balcony, hair dryer, satellite television with radio, mini-bar, safe, common area with desk, and internet connection (for an additional fee). 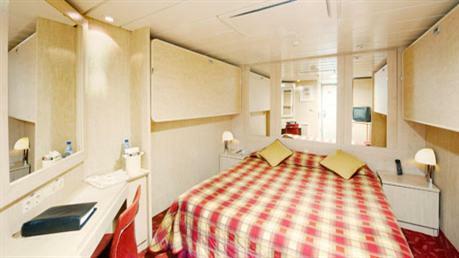 Two single beds that can convert into a European king-size bed, some staterooms have an upper bunk or two upper bunks to accommodate a third guest and/or fourth guest; a private bathroom with shower, balcony, hair dryer, satellite television with radio, mini-bar, safe, common area with desk, and internet connection (for an additional fee). The new Wellness Experience - powered by Technogym, gives you the privileged access to state-of-the-art fitness equipment, a comprehensive one-on-one health assessment, a personalized fitness program and a selection of healthy food and drink options to choose from. 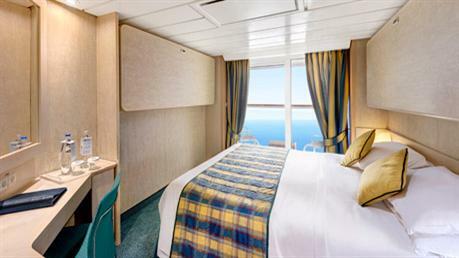 Two single beds that can convert into a European king-size bed, some staterooms have additional bunk/bunks to accommodate one or two more guests, a private bathroom with shower, window, hair dryer, satellite television with radio, mini-bar, safe, common area with desk, and internet connection (for an additional fee). 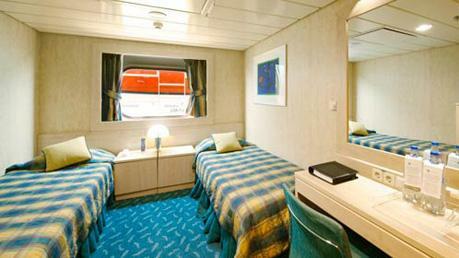 Two single beds that can convert into a European king-size bed, some staterooms have additional bunk/bunks to accommodate one or two more guests, a private bathroom with shower, window, hair dryer, satellite television with radio, mini-bar, safe, common area with desk, and internet connection (for an additional fee). The new Wellness Experience - powered by Technogym, gives you the privileged access to state-of-the-art fitness equipment, a comprehensive one-on-one health assessment, a personalized fitness program and a selection of healthy food and drink options to choose from. 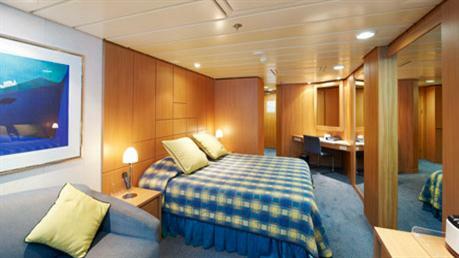 Two single beds that can convert into a European king-size bed, some staterooms have additional bunk/bunks to accommodate one or two more guests, a private bathroom with shower, hair dryer, satellite television with radio, mini-bar, safe, common area with desk, and internet connection (for an additional fee). 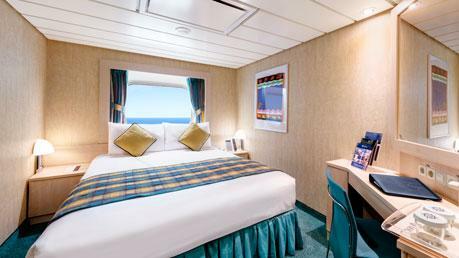 Two single beds that can convert into a European king-size bed, some staterooms have additional bunk/bunks to accommodate one or two more guests, a private bathroom with shower, hair dryer, satellite television with radio, mini-bar, safe, common area with desk, and internet connection (for an additional fee). The new Wellness Experience - powered by Technogym, gives you the privileged access to state-of-the-art fitness equipment, a comprehensive one-on-one health assessment, a personalized fitness program and a selection of healthy food and drink options to choose from.